Melbourne: Japan's Naomi Osaka battled past Czech eighth seed Petra Kvitova 7-6 (7/2), 5-7, 6-4 to win her first Australian Open crown Saturday and become the new world number one. A nervy Osaka opened the match with a double fault but she quickly regrouped and comfortably held. Most of the crowd were pro-Osaka but Kvitova didn't let it get to her and she held her first service game to love, with Osaka's returns flying long. Not to be outdone, the Japanese star also held to love and it was 2-1 after just six minutes. The powerful Kvitova backhand helped create two breaks points in a tense fifth game, but the gritty 21-year-old saved them both. The Czech survived her own mini crisis in the next game, saving a break point with little between the players. Osaka dug herself out of a hole in the seventh game, rallying from 0-40 down to keep the match on serve. A fired-up Kvitova then saved two set points at 5-6 to force the set to a tiebreak, only for the ruthless Osaka to move up a gear and take it 7-2. The experienced Kvitova hadn't lost a set all tournament until now and she responded emphatically. She stayed calm to hold serve then sent a powerful forehand down the line for break point in the next game. It was saved but there was nothing Osaka could do on a second break point, having no answer to a Kvitova crosscourt forehand to give the Czech a 2-0 advantage. But Osaka is a fighter and some poor serving by Kvitova allowed her to break straight back. Osaka was on fire and returning serve well with a poorly executed drop shot from the Czech giving her another break for 3-2 as the crowd rose to their feet. With Kvitova on the ropes, the Japanese fourth seed raced to three championship points at 3-5 and it looked all over, but she couldn't covert any of them and a forehand long allowed the fearless Kvitova to somehow break back for 5-5, with Osaka smashing a ball to the ground in frustration. Kvitova held serve and then broke a wilting Osaka again to take the set as the rattled Japanese walked off for a bathroom break with a towel over her head. 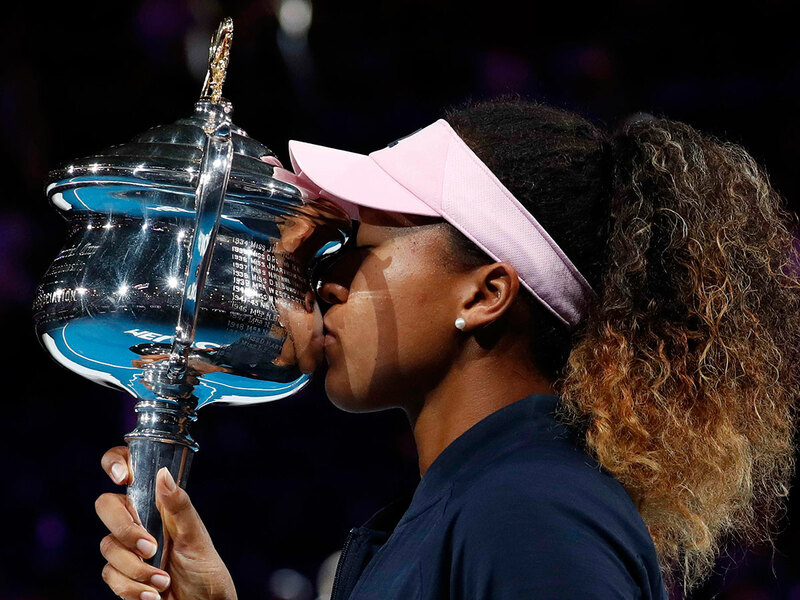 Both players held serve as the deciding set got underway, but Osaka was under the pump, knowing she had one hand on the trophy only to throw it away. The 21-year-old, though, was not ready to give up and a double fault on the Kvitova serve handed her a break point and a huge backhand sealed the game to give her a 2-1 advantage. She held for 3-1 courtesy of some big groundstrokes as the momentum, and the crowd, swung firmly in her direction. Kvitova pulled out a booming ace to hold the next game and stay in touch. She worked a break point in the next, but Osaka held firm to move 4-2 in front. The never-say-die Czech went 0-40 down in the seventh game, but somehow came back from the death with two booming aces helping her keep the match alive. It went to 5-4 with Osaka on serve and the Japanese star made no mistake this time, falling to her knees, head bowed after claiming her first Australian Open title and second Grand Slam in a row.